When I was a kid, being a cop was one of the desirable career choices in my adult future. Heck, every little boy wanted to be a cop when they grew up. From Dragnet to Hill Street Blues, police work was noble, honorable, courageous work. Nowadays there's a 10 percent vacancy-rate nationwide, and many of the best and the brightest are finding other career paths besides law enforcement. Louis Porter has a story in today's Rutland Herald and Times Argus about the shortage in Vermont. 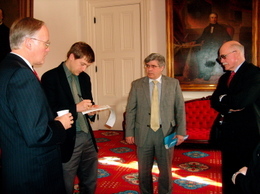 That's a shot we took of Louis with his pen and notebook yesterday in the Statehouse Ceremonial Office following Gov. Jim Douglas' uneventful weekly presser. Administration Secretary Mike Smith and Chief of Staff Tim Hayward are to his left. Currently there are 27 unfilled positions at Vermont State Police. Another dozen are on sick leave and five more are on active duty with the US military in Iraq. The programs are available around the state on public access cable and on Ch. 17 on Comcast in beautiful Burlington. Also available online right here. Thanks to Vermont Yankee, CVPS and Associated Industries of Vermont for their underwriting grants. Thank you so much for Counterpoint. I've been unable to get it on our local access and I've enjoyed the program in the past. The million Pat got us should help the cop problem a little shouldn't it? ....and on channel 17 on BURLINGTON TELECOM.